"Eoconfuciousornis zhengi pair in level flight"
Copyright © 2018 Michael Rothman. This image is available for reuse purchase. 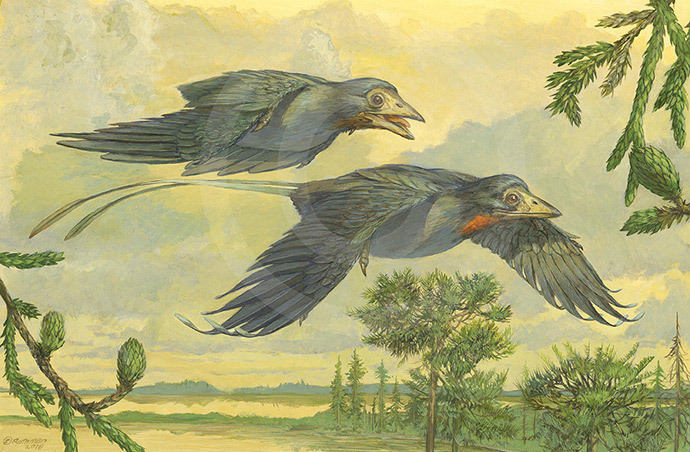 Michael Rothman DescriptionThis is an illustration of a pair of Eoconfuciousornis zhengi in level flight. It was used as the cover illustration for the Jan. 2019 edition of Vertebrate Palasiatica, 57 (1): 1-37 to accompany the monograph "A taxonomical revision of the Confuciousornithiformes (Aves: Pygostylia). Wang M, O'Connor J, Zhou Z H 2019.